It’s no secret that the New Jersey Devils’ prospect pool has been thin, especially at forward. That was until the arrival of General Manager Ray Shero on May 4, 2015. He replaced the longtime GM and face of the franchise Lou Lamoriello. Now, in 2017, the Devils are a fully replenished pool of youth, but some difficult decisions need to be made at the end of training camp. Luckily, the Devils have an abundance of salary cap room for down the line should these players live up to the hype. With this in mind, let’s take a look at the prospects that could be in the lineup come opening night. When the Devils selected Nico Hischier first overall, it ended months of speculation. 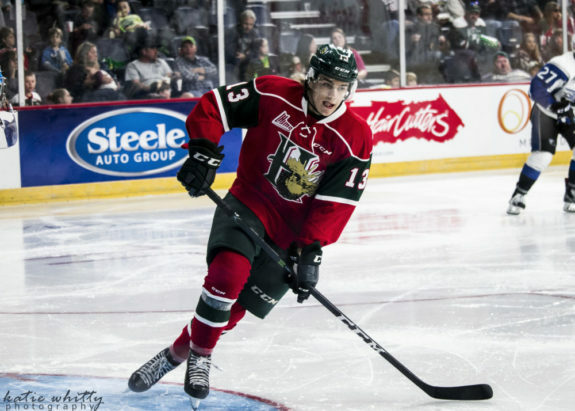 He played last year in the QMJHL for the Halifax Mooseheads and became the highest drafted Swiss-born player ever. Originally projected to be picked at 16th in TSN Bob McKenzie’s pre-season draft, Hischier changed things. After a great season with the club and playing for the Swiss national team at the World Juniors, he leap-frogged Nolan Patrick to be selected as the first pick. Last year, he racked up 38 goals and 48 assists, good for 86 points in 57 games. With Hischier, the Devils get a fast dynamic and highly skilled two-way player. He has great hands and is dependable in his own zone. He also has hockey sense and can see plays before they happen, get in the open lane and escape the oncoming forecheck. The Devils will be looking for him to bring that game into training camp but there is no pressure as Shero has gone on to say, “that he’ll make a difference, but how quickly will be up to his development path.” The sky is the limit for the kid from Switzerland. Mcleod was the Devils’ first-round pick at #12 in the 2016 Draft but they felt he could learn more in Junior. 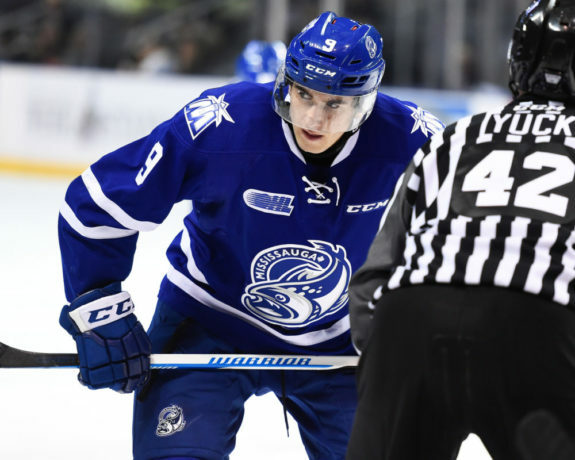 He returned to the Mississauga Steelheads of the OHL where he would captain the team for the season. After a slow start by his standards, he went on to light it up and even earned a call-up to the Canada U20 team where he won a silver medal at the World Juniors. This season with the Steelheads, he scored 27 goals, assisted on 46, which was good for 73 points in 57 games. He is a talented power center whose size and skill make him difficult to contain. He also possesses great competitiveness and good puck-handling skills which aid to his overall quality as a player. He is one to watch when the selections are made. With his ability and style, the Devils will find it hard for him to not make the team. I would expect to see him in the lineup come October. Selected as the 30th overall pick in the 2014 Draft, the Devils chose Brandon Wheat Kings John Quenneville. He did not have the most productive year, leaving the Devils to feel comfortable sending him back for his last year of Junior eligibility. He had 73 points in 57 games compared to only 47 the season previous. His play also helped the Wheat Kings get to the final that year, putting up 27 points in 21 games. He spent the next year with the Albany Devils working on his all around game and wanting to be more of a 200-foot player. Coach Hynes admitted he wanted to see him work on his overall play not just with the puck but without it. Over the course of the season, Quenneville went on to lead Albany in scoring, putting up 46 points in 58 games. He played in 12 games with the Devils last season but will be looking to crack the lineup. With the exit of some big physical players perhaps there is a spot for him. Speers was selected with the 67th overall pick in the 2015 third round. The New Jersey Devils chose him from the Sault Ste. Marie Greyhounds of the OHL. 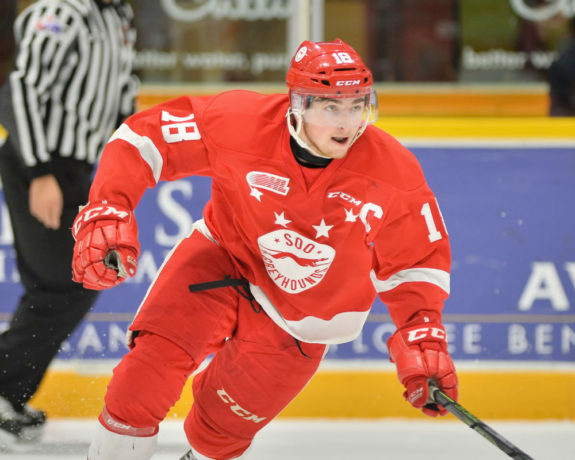 Once selected, the Devils returned him to Junior to work on his game and that year he was named the captain of the Soo Greyhounds. He went on to put up 74 points in 68 games and returned to the Devils training camp with his head held high. 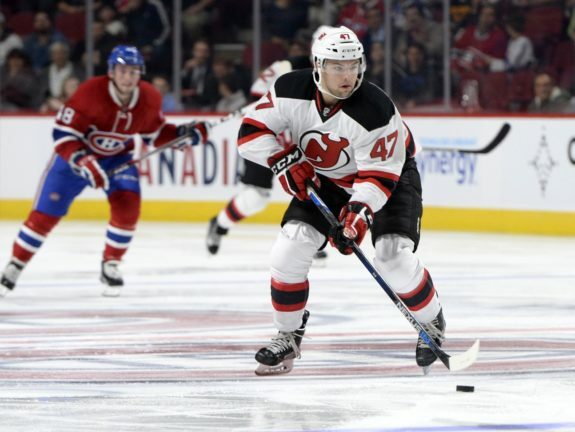 He started on the Devils roster by playing three NHL games before returning to fulfill his last year of Junior hockey. He has an offensive upside to his game with good puck-handling skills. Speers has great hands and a very accurate shot. He is not the biggest body but is not afraid to get into battles along the boards. He plays right wing as well as center but the former is something the Devils are currently lacking. This could create an opportunity should they not go with him in a fourth-line center role. Both options should be considered should he make the lineup. Mckenzie Blackwood (G), Nathan Bastian (RW), Joey Anderson (RW), Nikita Popugaev (RW).